Parents of Maurice R. Harrison Jr. were Maurice R. Harrison and Helen Cowles Harrison, Grand Parents William Harrison and Zena Harrison. Maurice Sr. and Helen were married in 1916 after he had graduated from Iowa State. Helen graduated from Drake University and was a Kindergarten Teacher … which she hated. After graduation, Maurice Sr. immediately went into the Army, preparation for World War One. His training took place in Sparta, Wisconsin. Helen was with him. While there they met Paul and Dorothy Scott who became very close friends and who, in later years, brought the Harrisons to Miami, Fla.
To fight the Germans, My Dad went overseas to Germany as a Lieutenant in the Horse Artillery. He was wounded and spent six months in an Army Hospital at Fort Aren Breightenstein on the Rhine River in Germany. I was born during that period on August 1, 1918. When he returned to the U.S., he managed to go into the Paving Business in Iowa and Missouri. We lived in Des Moines and during the Summer we would go with him to live near a job site … Living in rooming houses, which was not a joy for my Mother. My Brother, John Cowles Harrison. was born in Des Moines in 1921 – three years younger than I. He also went to Edison High school but went to college at Purdue, where he graduated in Aeronautical Engineering. 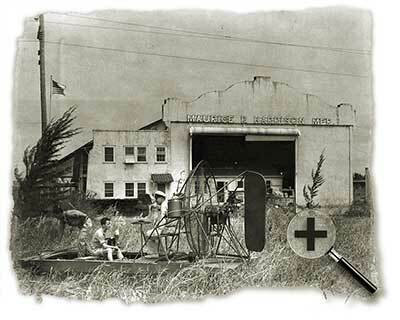 After graduation he was employed by the Curtis Wright Aeronautical Co. Soon after that he went into the Navy and saw much of the war with Japan as the Skipper of a Landing type Ship. When he returned to civilian life he joined our company and spent the rest of his working life as a Vice President of the company. John was married to Crutcher Field Harrison who had grown up in Miami. They had two Children, John C. Jr. and Helen. Johnny has stayed in Miami and is running his own Construction Business. Helen married John Witty and continues to live in Miami, living in her Parents old house in South Miami. 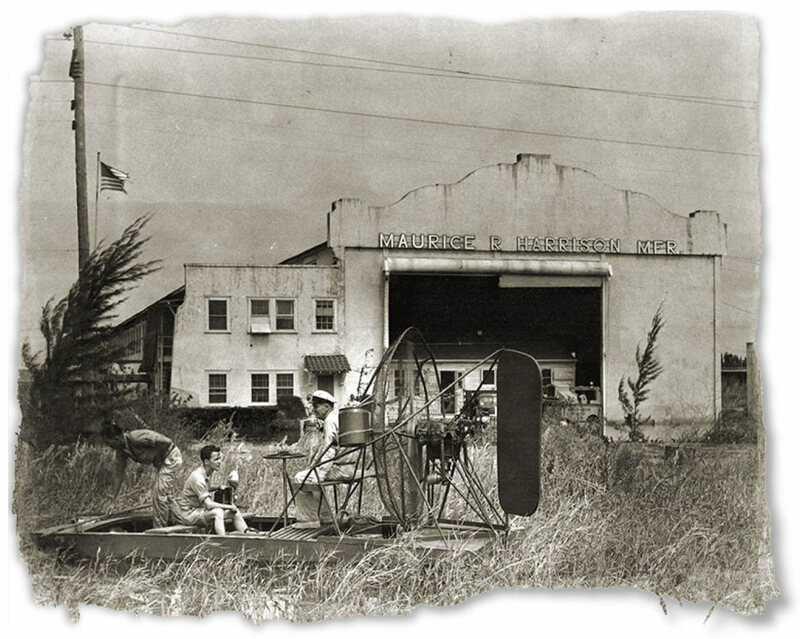 In 1925 Paul Scott called my Dad and told him that he could offer him a building opportunity in Miami and that he should move down there … which we did, arriving by train at Palm Beach where we were met and driven down two-lane Dixie Highway to Miami. My main memory of that portion of the trip was seeing a multitude of land crabs and hearing them pop under the tires. We were arriving for the “Land Sale Boom” which was a wild “buy and Sell” period and it lasted through 1929 when the “Big Bust” Came and nothing sold. People who were rich on paper were now finding themselves nearly penniless including the Harrison Family. During the next few years, up to 1934, my Dad continued to try to make a living for us in the Construction business, but this was almost impossible. We eventually had 60,000 hens laying a lot of eggs every day. It was listed in the Guinness Book of World Records as the largest hen house in the world. 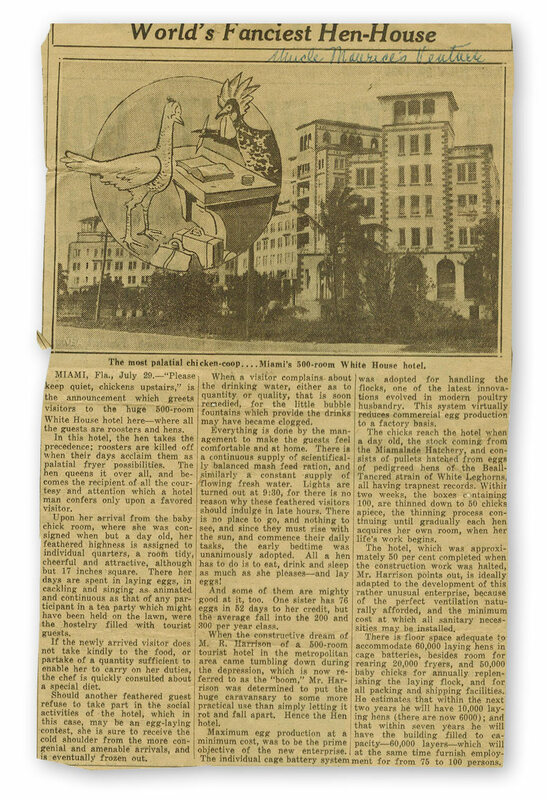 In 1934 there was only one house built in Miami and we did not build it. In 1934 Dad started a Chicken Business to sell eggs and fryers. 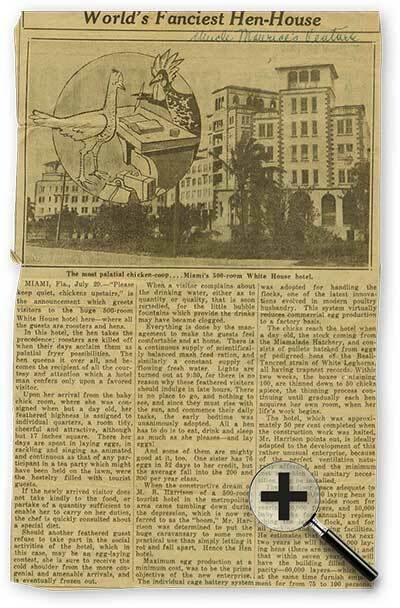 He did this in a unfinished hotel building on NW 27th Ave and 34th street called the Fritz Hotel. The exterior had been completed before the depression stopped the work, but the interior was open with no partitions. By then, I was working Summers and weekends and it was my job to get this building ready for chickens – in Batteries (Batteries provide individual cages for each chicken and were four tiers high and 300 feet long)—and we eventually had 60,000 hens laying a lot of eggs every day. It was listed in the Guinness Book of World Records as the largest hen house in the world. I later learned to grade and package the eggs and deliver them to individual customers and grocery stores. My high-school buddy Bill Frates and I worked together on this and developed a long continuing friendship. In later years Bill would start telling tales about our experiences with the chickens and would end up on the floor laughing. Bill had a heart attack and died about 1975. One of our stories concerned our having to take a barrel of very dead chickens to the incinerator. Every time we came to a stop light we would have to get out to avoid the stench. This activity occurred about once a week. Bill Frates, in later life, became a very successful trial lawyer and represented some of the “Water Gate” political aids to President Richard Nixon. My Folks had built a big home for us in Miami Shores at 1245 N. E. 96th St., during the boom days in 1928. Later it was lucky that we had a big house because both of my Grand Mothers had to move in with us. One after a stroke and the other with heart trouble. In addition, we had to have an aide to care for the stroke victim. With practically no construction business during this period and only the chickens to sustain us, times were tough. My Dad had learned to fly on his own and with his Army back ground he was appointed Squadron Commander of a Reserve Marine Corps flying unit that was being started in Opa Locka. This gave him recreation that he loved and paid him a pittance. It probably saved his mental health – times were very bad. One of my old school friends, Howard McCay, decided to join Dad’s squadron. Dad wanted to take Howard on his first flight which he did on a beautiful moon-light night. To give Howard a real thrill, Dad turned the plane upside down and flew over Biscayne Blvd. for some distance before righting. When he looked back to see Howard, he could see no passenger – it appeared that he had fallen out. As soon as the plane landed Dad stood up and looked in the back cockpit. Howard was huddled down in the bottom, as far down as he could get. My Dad survived without having a heart attack. Howard later became a Commercial pilot and flew for National Airlines for many years. In 1935 my Dad was Chairman of the Red Cross Emergency Action Committee. That year there was a terrible Hurricane that hit in the Keys and drowned hundreds of World War Veterans that were working down there on the Over-Seas Highway. Dad directed the volunteers who had to recover those bodies from the water, from the trees and many other strange places where they had been placed by this storm. To complete that job, they had to burn the bodies. I graduated from Miami Edison High School in 1936 and, that year, was accepted at Iowa State University where my Dad had graduated. The first year there I was not used to cold weather, had no overcoat and proceeded to get Pneumonia and nearly died. That was in the Fall and I had to stay out of school for the rest of the year. 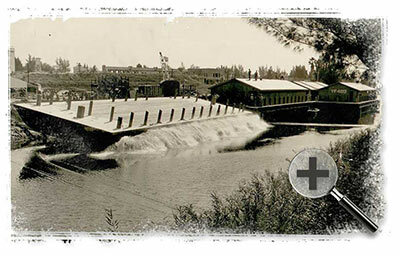 I graduated in Architectural Engineering in 1941. When I was sick in the hospital at the University, my Mother flew out and stayed with me for six weeks before we came home. Dad flew out in his Hell Diver, when I was the sickest and stayed till the worst had passed. In 1938 I had a blind date with Mae, my wife to be. She was in Nurses training at Iowa Methodist Hospital in Des Moines. For the next three years I hitch hiked to Des Moines, at every opportunity to court her. That hike was 33 miles long from the fraternity house to the Nurses home, and later her apartment that she shared with a friend. At two in the morning, with four to six inches of fresh snow on the ground, getting back to Ames was a challenge. I was still in school on Dec. 7th when the Japanese attacked – graduated at the end of the next quarter. When I got back to Miami, my Dad had gotten into War work and my first job was building 125 small houses in Clewiston for sugar workers. 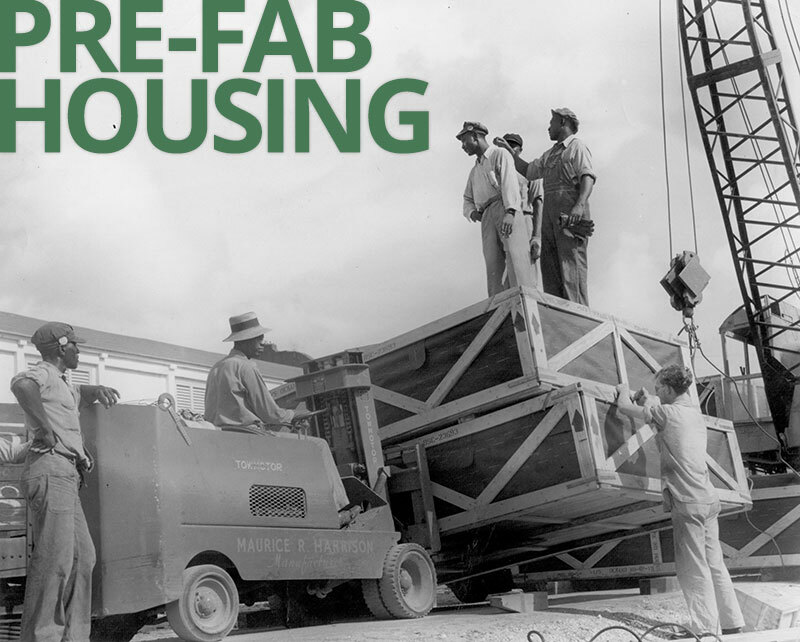 My next work was in Sebring, Florida where we did all of the development work and foundations for about 200 small houses for Navy personnel. 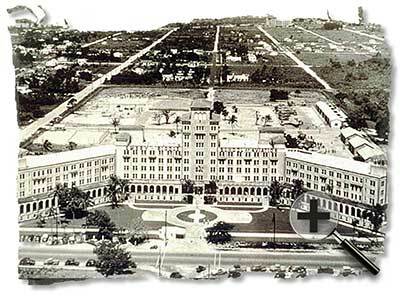 While in Sebring, I found a small house to rent and Mae and I got married, in Miami on May 16th, 1942. We were married on Saturday and Monday I was back running the job in Sebring. Incidentally, Moe had taken in the job inspector as a roomer to help pay the rent, This was not a good ingredient for newly wed people so it only lasted a few days. That job took about six months, after which, we moved back to Miami and bought our first house, a two bed room – one bath on San Marco Island. That house was on piling and cost us $6,800.00 with a 4% thirty-year mortgage and monthly payments of about $47.00. We kept it for about a year and one half until it appeared that I would be drafted. I had been trying to get into a Navy Ship Repair unit but was turned down because of bad eyes and varicose veins. Now it seemed that if you were breathing, the draft would take you. They sent me up to Camp Blanding for my physical and I even failed that So, now I would never be able to be in the service. We were so sure that I would get into the Service that we sold our little house and moved in with my Parents. By now, we were deep into building boats for the Army – we built 5,500 of them before the demand was over. Our first Son, Maurice R. Harrison III, was born during this period January 31st, 1944 while we were still living on San Marco Island. Mae helped me lay up a brick wall when she was very pregnant. This activity didn’t seem to hurt the baby in the least – he was born strong and well. Our two other Boys Michael John Harrison, born October 14, 1945 and Peter Richard Harrison, born October 14th, 1946 arrived to total three Sons all with in a three year period. You could say that Mae was going full blast. Seven years later we got a certificate from the Diaper Service Co. Congratulating us for having used their service for a continuous seven year period. During this period we brought two Cuban girls, at different periods, to help with care for the babies. These girls would stay with us long enough to learn a little English and would then leave and go to New York (which they always called ”New Jerk”). These girls were great, while they stayed. When the second Cuban girl left, Mae was desperate. She put an add in the DesMoines Register and Tribune New which circulated all of Iowa. She advertised for a “Mother’s Helper, to whom she would be given a private bed room and bath, a radio, (no TV in those days) and weekly wages. She had many answers and then, when Moe was out of town and she was particularly worn out, she sent one of these people an offer to come down. This was Laura Hilton, and she did come and she did stay with us for about 45 years—she was 98 years old when she went to live with her Daughter and she was still able to help (the Champion of the Dish Washer) around the house. We were moving to an apartment, and had no room for her and this wonderful association had to end. By now, we were deep into building boats for the Army – we built 5,500 of them before the demand was over. They were 14 ft. plywood assault boats that were to be used by the Army to cross rivers. The boats would be stacked, like Dixie Cups on a truck and would be taken off by the men and then paddled across the river with their shovels. We built a lot of those. The other War work that we got at that time was building wooden barges for the Navy. These were 110 ft long and 34 feet wide and had a warehouse built on them. We had to build a yard to do this and it was my first job after Sebring, to build the yard and the equipment to build these. We built the bottoms up side down to make the planking and caulking easier. Then we had turn these bottoms over and add the sides and eventually the deck and ware house. We did this on an assembly line, finally launching the finished product into the Miami River after moving it across highway #27 at night We built 14 of these barges. 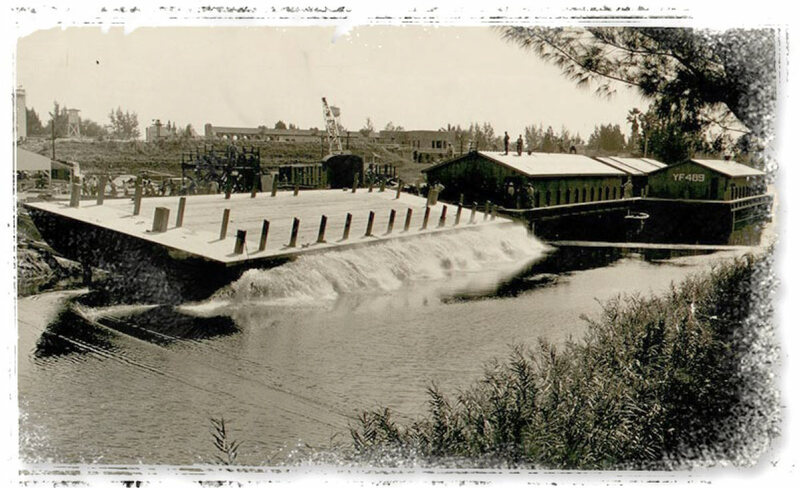 Our Company was now called “Gibbs Harrison Marine Co. and was located on W. 9th street in Hialeah. Our next marine project was an order to build 24 wooden oil barges for the Navy. These were 134 feet long, 34 feet wide and 10 feet high. We were able to our same methods and equipment to build these. We even built a railroad spur into our yard—about a mile long—to bring in all of the timbers that we needed. To build this line we hired Seminole Indians to do the work. The finished product was very helpful for this and the undertakings, yet to come. Our next contract with the Government was to build pre-cut houses for England to help ease their terrible housing problems brought about be the war. We built about 500 of these – each one having to be boxed into many crates to hold all of the framing, siding, floor panels, etc. The exterior was a cement asbestos board that had to be cut to exact sizes and boxed. Today, asbestos board would be a no-no. Our boat building plant adapted very nicely to this work. When this contract was finished, the war was over and we wanted to keep our plant busy with some product. We tried Sport Fisherman Boats, plywood, but that was not a winner. We did build Portable School Rooms for Dade County—over 100 of them, These we would build complete in the plant and move them to their site. Our next project for us and the plant was to build pre-fab houses which we built complete in the plant and moved to their site. In this case we were the developer and the builder. We built about 600 of these after which it seemed as though the housing market was flooded and we stopped. Now there was no more plant work so I set out to get our old Construction Co. going again. My Dad had retired so I was on my own and by myself. Soon after that, my phone rang one night when I was at the office. It turned out to be Rod Overholt, whom I didn’t know but who had graduated from Iowa State. He was looking for a job – so the next day I hired him and we worked together for over fifty years. 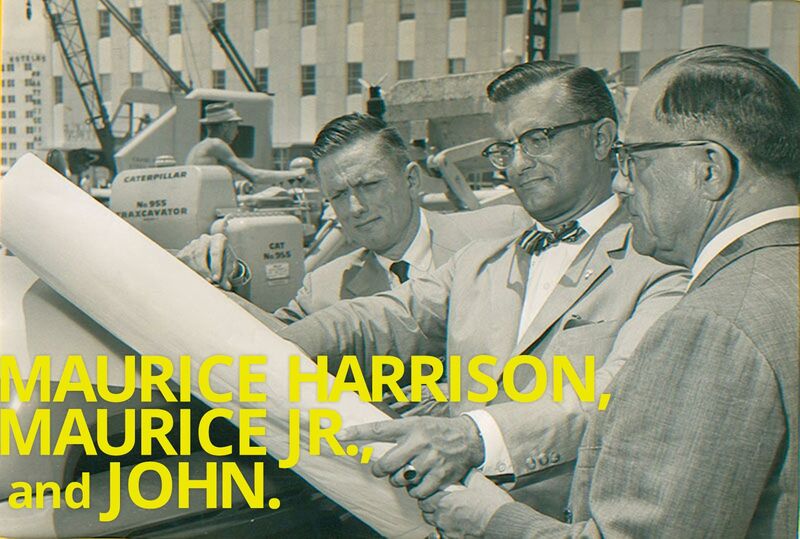 I was President and Rod was Vice President of M. R. Harrison Const. Corp. 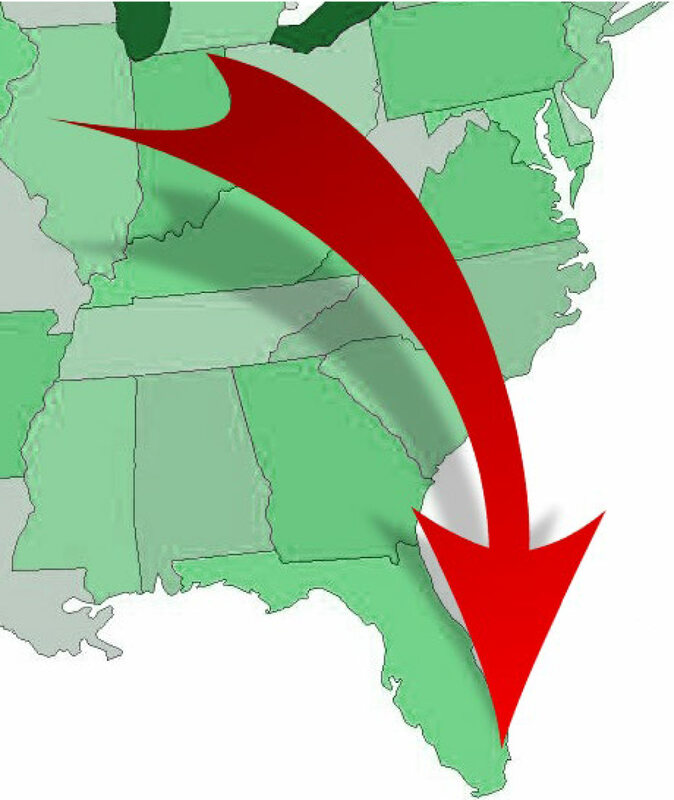 The company no longer exists but while we were active we built Shopping Centers – Bal Harbour Shops among them, Parking Garages, buildings for the University of Miami, Buildings for Fla. P. and L., a very large plant for Motorola in Boynton Beach, School Buildings – Dade County Junior College, Key West High School, Key Biscayne Elementary, etc. 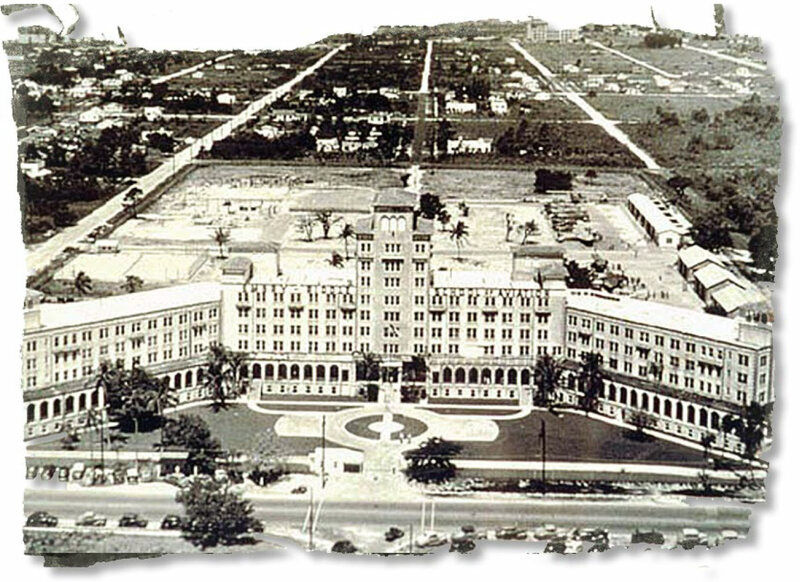 We built numerous parts of the Miami Airport and several high-rise Condos on Brickell Ave and Miami Beach. These are only a few of the many building projects we built – there were many more. We loved unusual construction challenges and conquered many of them – construction that goes under the ground water level in this area presents very big problems and we faced that many times.